Is it Winter yet? – Taylored Expressions June Release Day #2! Hello everyone, Welcome back. Today is day #2 of Taylored Expressions June Release sneak peeks. I am showcasing two products today. 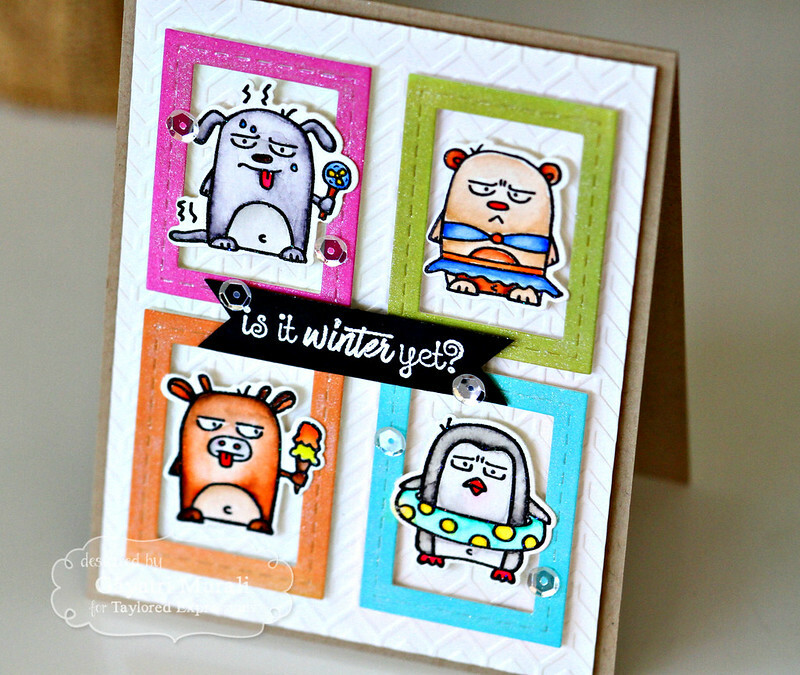 The first is Summer Grumplings stamp set and coordinating die set. Second is Summer Sunnies Overlays dies that coordinates with the older Summer Sunnies dies. 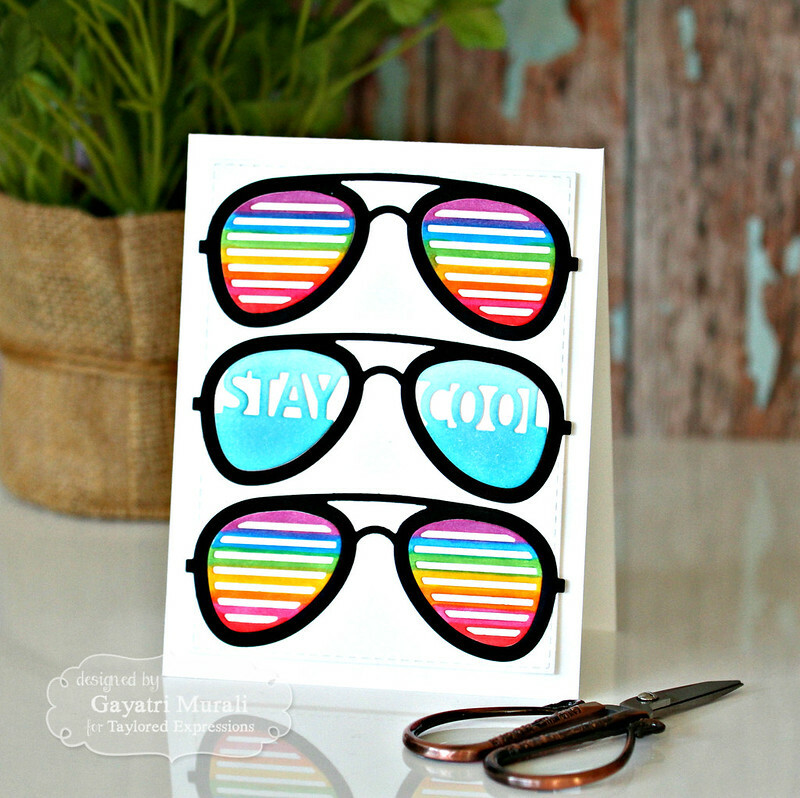 My first card showcases the Summer Sunnies Overlays dies. I die cut the Summer Sunnies in Oreo cardstock. Then I die cut the Summer Sunnies Overlays using Sugar Cube cardstock. I used copic markers to colour the stripped overlay in rainbow colours. The Stay Cool overlay is sponged with Cookie Monster dye ink. I adhered the Summer Sunnies die cuts on a stitched rectangle panel die cut using the largest Stitched Rectangle Stacklet. Then inlaid the rainbow striped overlays on the top and bottom sunnies and the stay cool overlay in the middle summer sunnies. Then this panel is adhered on a Sugar Cube card base using foam adhesive. for added dimension. 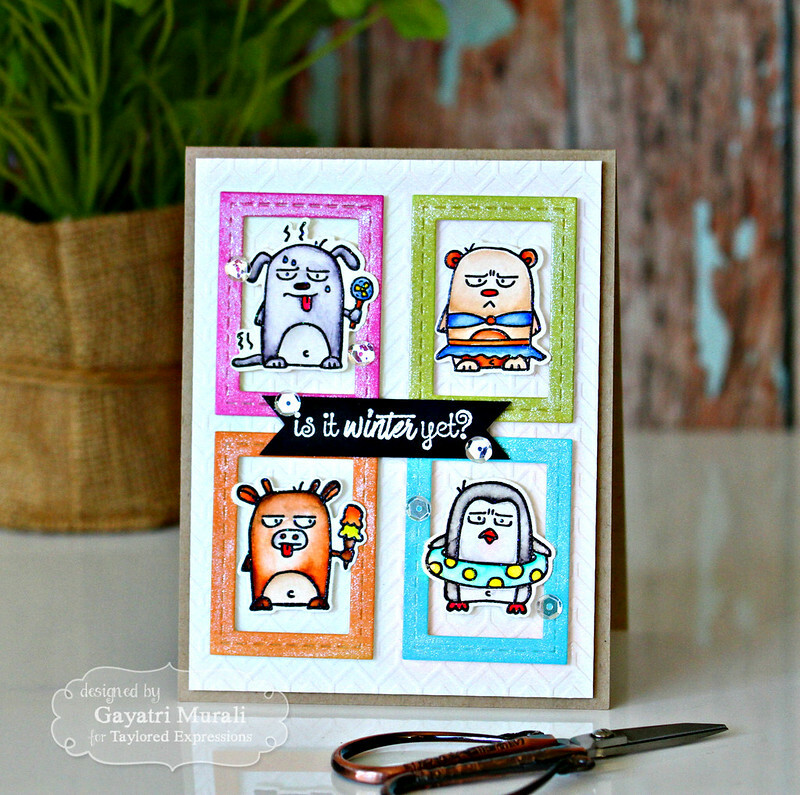 For my second card, I am showcasing a stamp set from one of favourite series – The Grumpling series. These grumplings are super adorable. This release has a new set called Summer Grumplings. This set has coordinating dies. I love this set very much. I have used all the images from this set on my card. For this card, I black heat embossed all the summer grumplings on watercolour paper and coloured them with zig clean brush pens. Once dry, I die cut them out using the coordinting dies. For framing these grumplings, I die cut the smallest frame from Stitched Frame Stacklets 1 and Sugar Cube cardstock. I then sponged each of the frame with Cookie Monster, Candy Corn, Lollipop and Granny Smith Taylored Expressions dye inks. I adhered these frames on a white panel embossed using Chevron embossing folder. Each frame had one of the die cut Summer Grumplings adhered using foam adhesives. The sentiment is white heat embossed on Oreo cardstock strip. I cut out fish tail on either side of the strip and adhered in the middle of the panel. This finished panel is adhered on Toffee card base. I embellished with some gorgeous sequins from Build a Scene Halloween and brushed the frames with Wink of Stella. Taylored Expressions is celebrating Release Week with some fabulous giveaways! 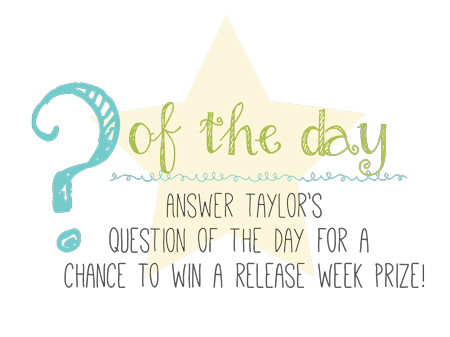 Visit Taylored Expressions Blog to answer Taylor’s Question of the Day for a chance to win a prize from the latest release. You will also find more sneak peek projects by Taylor and by talented designers on Taylored Expression Blog. Head over there and get inspired! Thanks you so much for stopping by my blog today! Wonderful cards! Those Grumplings are absolutely adorable! I love how you put them together. So cute! Those grumplings just make me giggle every time I see them. I love that line! And love what you did with them here! Thanks for these cards – looking forward to the new release!